When you think of a Mutt-i-gree, an adorable rescue dog or cat probably comes to mind. But have you ever considered that a stuffed animal could be an adequate substitute for teaching empathy and compassion? 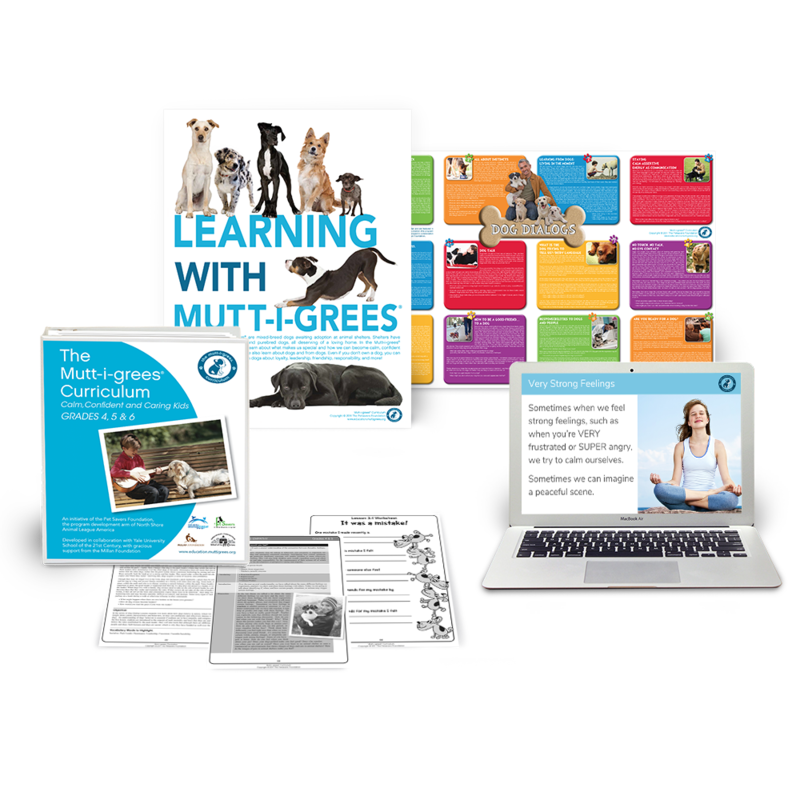 While increasing numbers of schools are adopting school dogs as part of the Mutt-i-grees Curriculum, one school district is making a point of not using a live dog! Indeed, the Curriculum was developed on the premise that the presence of a live animal is not essential. We know from the research that there is a vicarious aspect to the benefits of human-animal interactions and that even thinking about a dog or another pet results in our feeling happy and predisposed to positive social interactions. 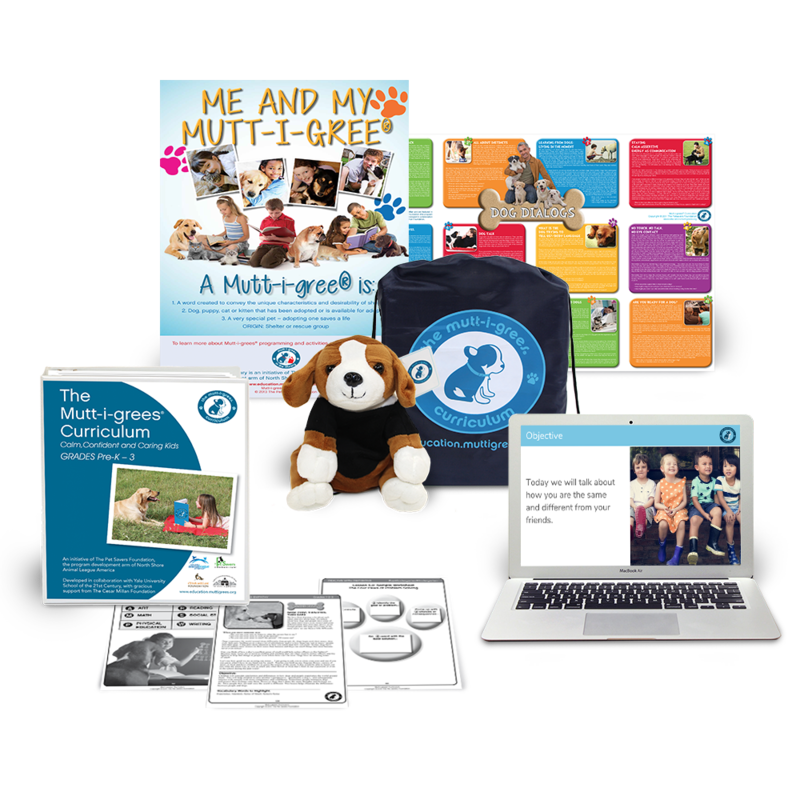 This is especially evident in the Independence School District (ISD) in Independence, Missouri, which has piloted a unique way to implementing the Mutt-i-grees Curriculum. Under the direction of Jennifer Walker, Director of Youth Development and Education, ISD is using the Curriculum by focusing on plush animals. Incidentally, prior to using the Curriculum every one of the afterschool Site Directors received his or her own plush, in celebration of completing training sessions that prepared them for implementation! 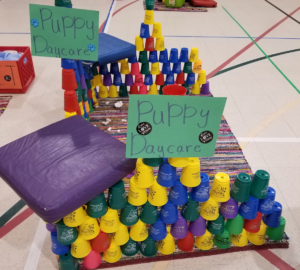 Every Tuesday, Dawn Jones, Site Director of one of the afterschool programs, includes the Mutt-i-grees Curriculum in the students’ weekly activities. From playing make-believe veterinarian to providing day-to-day care for plush animals, the students engage in activities that incorporate new lessons on compassion and empathy, which they practice throughout the day. The students were particularly enamored of the mock adoption program that Ms. Jones created. Each student had an opportunity to “adopt” a stuffed animal and decorate a carrier for the new pet. 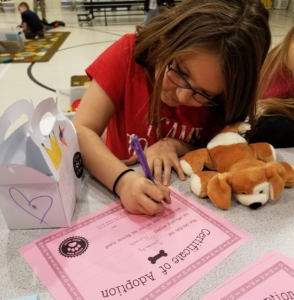 Every adopted “puppy” got a name and an adoption certificate, and students who were having a difficult time at school could take their adopted plush with them for the day for comfort and support. The fascinating part of this afterschool program is that even without a live animal, students netted positive results; taking care of a plush pet was enough to form connections in the students’ minds that kindled compassion toward other living things. One student in particular had a history of putting his hands on others and cussing, but after a few sessions with the plush Mutt-i-grees, the boy learned a valuable lesson in empathy and now understands why cursing and grabbing can hurt people’s feelings. Learning alongside the plush Mutt-i-grees also inspired the students to think about real animal shelters and ways to help homeless pets. Under the direction of a physical education teacher, a volunteer team of students made chew toys and treats for the animals and distributed dog food to the local shelter. Clearly, the students felt compelled to participate in service-learning activities, making a difference in their community. After receiving praise for the programming, the district decided to roll it out in 20 afterschool programs. We look forward to hearing about the many activities, fundraisers, and feel-good moments that will come out of this innovative school district as well as learn about the impact the program is having on the students, their teachers, and their local shelter!